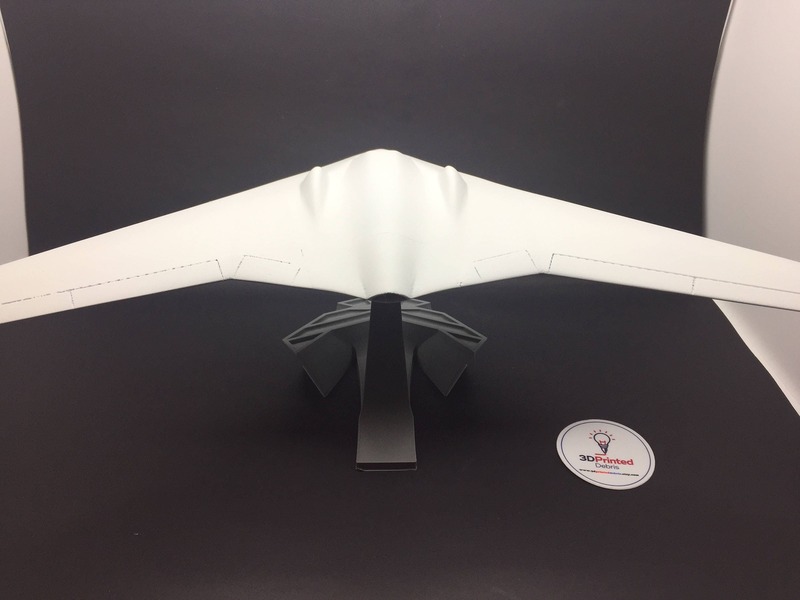 This is a model I designed for display inspired by the RQ-170 Sentinel (AKA Beast of Kandahar) Small Unmanned Aircraft System (SUAS, uav, drone, etc). This was done in collaboration with "Oranhunter", the guru of all things Blender. Thanks Steve! It has a 17 inch wingspan and is 6 inches tall when sitting on it's stand. It's pretty solid, and comes in at 12 ounces total weight. The stand has the modern USAF logo.. 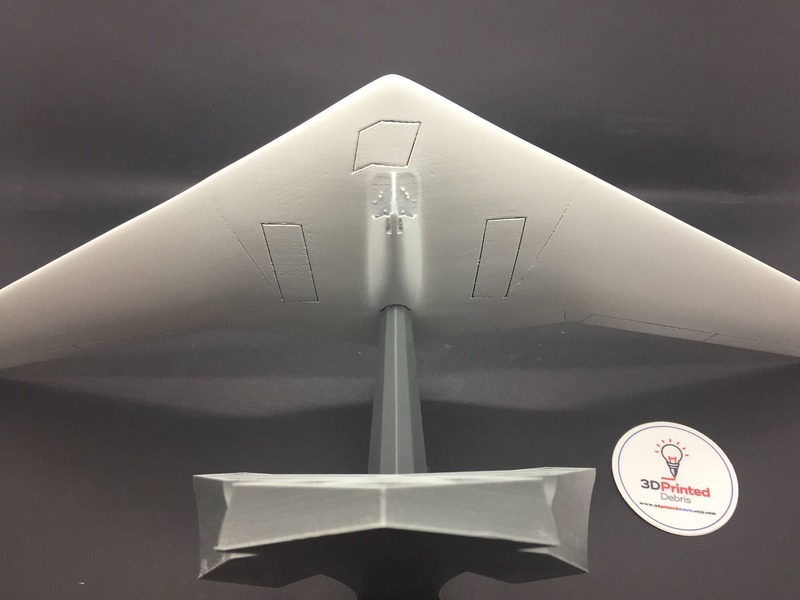 The wings feature interior fairings alongside the centerline. This is printed in gray, and the stand in silver. The print turns out so nice I don't feel the need to sand/paint it, but I certainly can if you want a flat white and smooth finish. If you order a raw print it will be printed in white. If you'd like another color combination or a custom stand, please use the "request custom order" button. 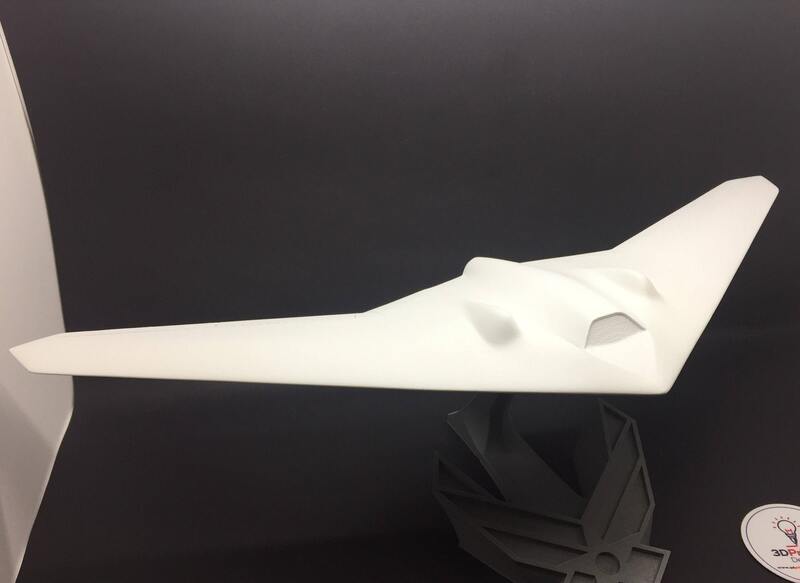 he Lockheed Martin RQ-170 Sentinel is an unmanned aerial vehicle (UAV) developed by Lockheed Martin and operated by the United States Air Force (USAF) for the Central Intelligence Agency (CIA). 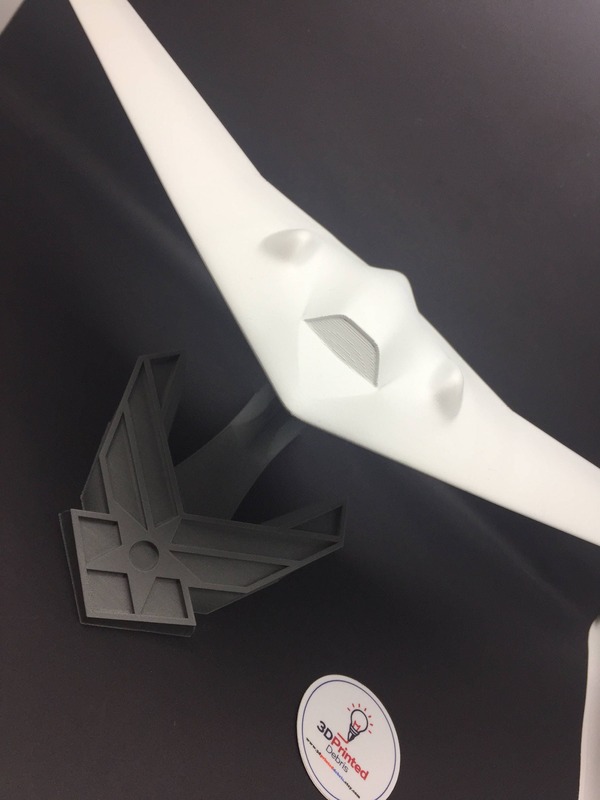 While the USAF has released few details on the UAV's design or capabilities, defense analysts believe that it is a stealth aircraft fitted with aerial reconnaissance equipment. RQ-170s have been reported to have operated in Afghanistan as part of Operation Enduring Freedom. It has been confirmed that the UAVs have operated over Pakistan and Iran; operations over Pakistan included sorties that collected intelligence before and during the operation which led to the death of Osama bin Laden in May 2011. In December 2011, the Iranian armed forces captured an RQ-170 flying over Iran. The U.S. military has acknowledged losing an RQ-170 in the region. United States administration asked Iran to return the UAV. Iran denied the request and lodged a complaint to the UN Security Council over airspace violation by the U.S. 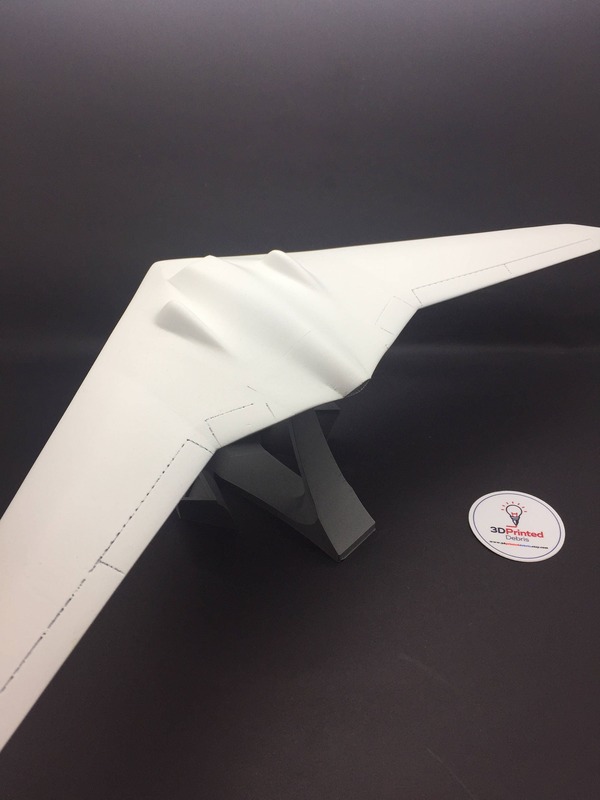 The SUAS is detachable from the stand, to make for easier shipping and transport. This is an excellent conversation piece for your desk or cabinet. 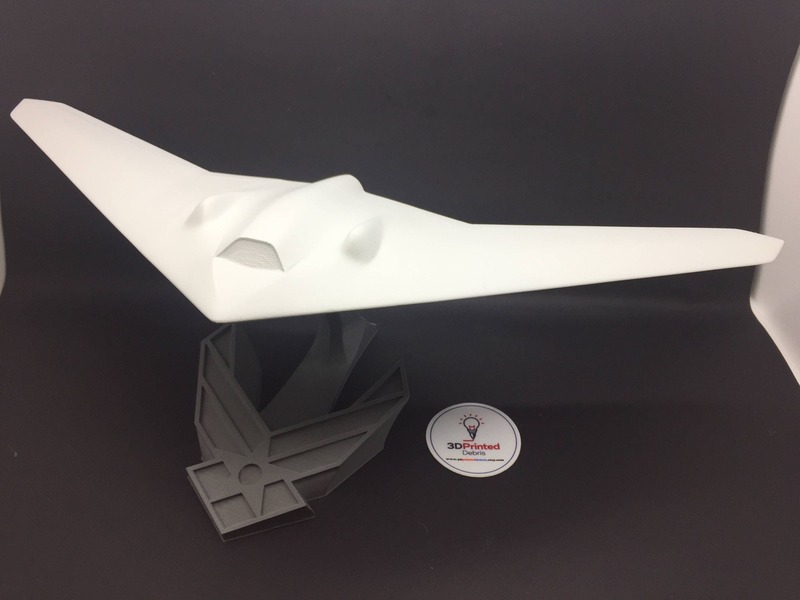 It's also a perfect going-away present for someone moving on to another assignment, or just a really neat gift for a UAV fan. I can make custom placards or add text to the plaque to personalize the item; please include what you would like in your comment when you check out. This is a 3D printed product, so there may be minor defects (rough edges, bumps, etc). I have spent months building my own machine to exact specifications for accuracy and surface quality, and I scrutinize every model very closely. I use only the highest quality filament to ensure colors are vibrant and defects are kept to an absolute minimum for both your item and my machine. Every item in my shop is test printed and checked for not only aesthetics, but also the intended use. All of my items I list I personally test to ensure they meet my stringent standards. All items are printed in PLA, an organic non-toxic plastic made from corn and is biodegradable, yet very strong. PLA will not degrade under normal use, but will break down when buried. If I'm not happy with it, it doesn’t ship. You will get my very best work, which you will find is a cut above the rest! 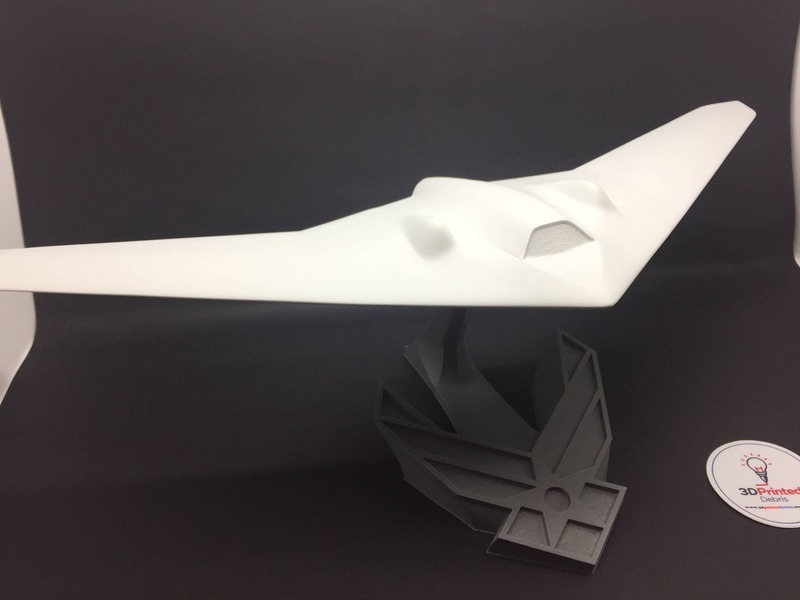 Please note, this creation is a work of fan art and is in no way affiliated with Lockheed Martin Inc.
Payment prior to starting work or initiating delivery. I can accept Etsy payments or paypal. Make sure your mail and packages arrive in time for the holidays by mailing before these recommended deadlines, excluding Alaska and Hawaii. Send-by dates for expected delivery before Dec. 25th (Actual delivery date may vary and is based on origin, destination, Post Office acceptance time, and other conditions). For Priority Mail Express® shipments mailed December 23 through December 25, the money-back guarantee applies only if the shipment was not delivered, or delivery was not attempted, within two (2) business days. It will take me at least the minimum number of days (i.e. if the item says 5-7 days, 5 is the minimum it will take me to make it and ship it) to make the item and get it in the mail, so please add that to the USPS deadlines to ensure delivery before Christmas. All items are sold as-is and are made on-demand, so I don't exchanges. I accept returns within 30 days of delivery, all that I ask is that you pay the return postage. If an item is damaged in shipping, please take a picture and contact me via conversation. If it can be repaired I'll ask you to ship it back to me and I'll fix it. Requests for cancellations made after I have already started working on an item will not be honored. A quick note on turn-around times - If you see "QTY 10" for a given item, that doesn't mean I have 10 made and they will ship instantly. It means I can make 10 of them inside of the advertised delivery date listed. If you ask me for an estimated shipping date and wait 5 days to actually buy the item, the ship date will slip to reflect the delay in purchase. Photo copyright release: if you upload or email a photo to my site or to my inbox you are giving me permission to use it in social media or for marketing purposes. I will not cite the source of the photo, and I might create a derivative (filters, cropping, etc) of your photo. Barrel Plugs: Any prop or replica that could be confused with a real firearm will come with a Blaze Orange plug permanently affixed per federal regulation for marking such items. I do not collect personal information other than what's legally required for tax purposes. I do not sell customer information under any circumstances. From time to time I may release a new item that is a companion to something you've already purchased from me, and in that case, I may send you an email letting you know it's newly listed on my site. This was a gift for my husband’s promotion. He loved it! And says the details are spot on. Thank you so much!